The unstable beta 2 is available with analog functions !! Beta 3 will be soon available with USB implementation. A python script will be used as an OSC server to insure communication with pure data ord processing. For the moment it is an unstable version, only for Linux. France Cadet and me are invited at the tweak festival in Ireland this week. We will make a workshop to hack some robots. 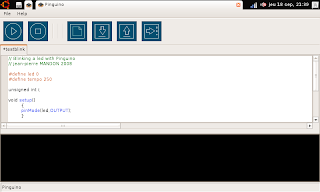 This is the first tests of Pinguino in the hacking world !! This is a picture of pinguino with the chimp and the EEEPC. It seems that pinguino can drive a Wowee chimp !! Pinguino beta 1 OSX is available !! Great job !! Guillaume STAGNARO made an OSX version of Pinguino. You must install libusb to communicate with the board. I have tested Pinguino IDE on my eeepc. It works with eee ubuntu 8.04. You need to compile pyUSB and install wxpython2.8 but all works without any modification. I think it is the smallest development system we can find !! Pinguino beta 1 is now available for Windows. Pinguino beta 1 is avalaible for Linux. This is the 'hello, world' of electronic !! The led is connected on the output 0 ( RB0 ). See the ReadMe file and the changelog to see what is yet implemented. This is the last release of the downloader for the pinguino board. This downloader is written with Python 2.5, wxpython and Pyusb. This is the original PUF bootloader with our ProductID. The configuration bits have been adapted for a 18F2550 with a 20 Mhz clock. The sources will be avalaible as soon as the compatibility with the Vasco project will be complete. Pinguino has now a regular VendorID/ProductID. It is used by permission from Microchip Technology Inc. under a sublicense agreement to me. This VID/PID may only be used with Microchip products. Thanks to Microchip for supporting this project.